Can Your EMV Solution Walk the Walk? We provide a complete, seamless solution for EMV smart cards. Future POS offers pay at the table, 3G to accept payments anywhere, built-in barcode scanning, built-in GPS for delivery directions and driver’s license verification. Can your POS handle all that? The PAX A920 handheld device provides your workforce with increased efficiency and mobility while giving your customers faster service. Our handheld solution is a powerful addition to any Future POS install. Reduce ordering time with our fast, simple and customizable multi-column modifiers. Every option for an item can be found in one modifier window. No need to click from screen to screen or search for buttons on different menus! Future POS is regularly featured on the hit TV show Bar Rescue. Host Jon Taffer makes use of our award winning point-of-sale software to help struggling bars and nightclubs improve their profitability. 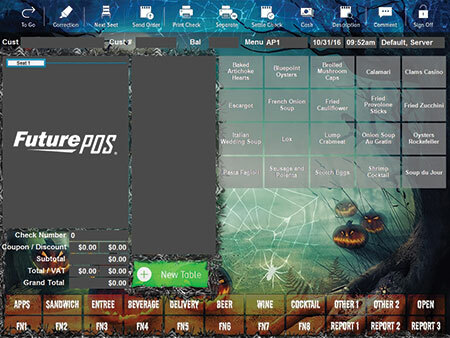 Our Advanced Front of the House Themes allow you to easily change the entire look and feel of the Front End of your Future POS system. In addition to custom themes that can be provided by the customer, there are also seasonal themes that change the look and feel of the popup windows based on what holiday is coming up. Future POS v6’s Cloud based technology brings end users true operational freedom. Experience the power of controlling your business’s back of the house whenever and wherever you choose. Future POS is open to feedback and they make me feel as if I am their only client. This is a refreshing change of pace compared to most other IT experiences I've had working with other vendors. Based on our experience, any restaurant should be very pleased to do business with Future POS. They are, by far, one of the best companies I have ever dealt with. We were getting killed with EMV chargebacks. Future POS gave us several options including EMV pay at the table. It's quick, safe and now my customers and my business are protected. What I like about Future POS is it's long tenured. It's the ease of the system, ease of reports; it's a one stop shop. The staff likes it. It's real easy to learn. We spent a lot of time and looked at many POS systems. We wanted something that would be multi-functional and that would grow with us as we expanded our resident satisfaction experience. Our Solutions Are Perfect for Your Restaurant!